The key mission of scanners in the health care industry is to improve the quality of patient care while reducing medication errors. Additionally, health care environments have requirements that scanners need to be regularly cleaned and disinfected. Datalogic's Gryphon Health care (HC) product series is specifically developed for health care applications with Disinfectant-ready enclosures treated with antimicrobial additives which are designed to withstand daily cleaning with harsh disinfectant solutions. Perfect for both handheld and presentation reading, the GM4400-HC 2D imager features Datalogic"s Motionix motion-sensing technology which detects the natural actions of the operator to automatically switch the scanner into handheld or hands-free scanning modes. Datalogic's unique two-position cradle allows for presentation style reading while the 'Scan-While-Charging' feature adds extended productivity. 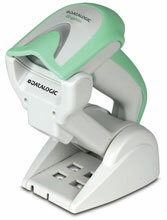 The Datalogic GM4411-HCK10-BPOC is also known as Data Logic	DTL-GM4411HCK10BPOC	or GM4411HCK10BPOC	.